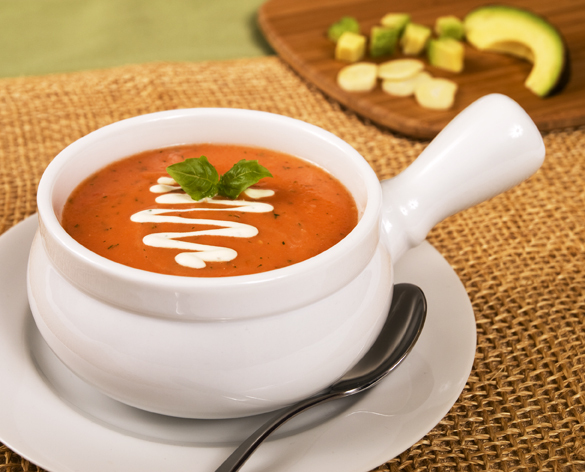 This vegan tomato soup is so creamy….that no one will know there’s no HEAVY CREAM in it! In a medium sauce pan saute the onion in the olive oil along with the crushed garlic. Add the broth and turn stove to medium heat and cook on low heat for about 15 minutes. Working in batches add the vegetables and broth to a blender. After all the ingredients are thoroughly blended, transfer back to the pot and bring to boil for a few minutes. Once the soup is done cooking, add half of the cashew cream to the soup and mix well. Save some cream and basil to garnish the soup. Rinse the cashews, add to a high speed blender with the water and salt. Blend until smooth.